The United Nations Standard Rules for the Equalization of Opportunities of Persons with Disabilities, adopted by the General Assembly in 1993, provided for the appointment of a Special Rapporteur to monitor the implementation of the Rules. The Special Rapporteur reported yearly to the Commission for Social Development. The reports presented findings on the promotion and monitoring of the implementation of the Standard Rules and present recommendations, as requested by the Commission, on their further development. In carrying out his/her functions, the Special Rapporteur established a direct dialogue with Member States and with local non-governmental organizations and experts, seeking their views and comments on any information intended to be included in the reports. 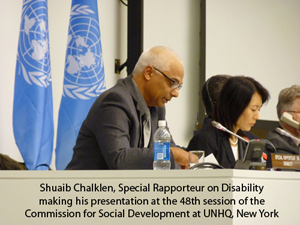 The last Special Rapporteur on Disability of the Commission for Social Development ended his term on 31 December 2014. Report of the Special Rapporteur to the 50th Session of the Commission for Social Development: Note by the Secretary-General on monitoring of the implementation of the Standard Rules on the Equalization of Opportunities for Persons with Disabilities (E/CN.5/2012/7).